Mayonnaise. It's one of the only things I miss about not having a refridgerator. My boys love deviled eggs, summer mayo salads and sandwich fillings. We even tried keeping mayo in the cooler, but wasted so many jars that we stopped eating it all together. I don't know why it had never occured to me before, but small batches of mayo from scratch seemed like the perfect solution. I watched a few videos, took a deep breath and gave it a try. For my first batch, I used this recipe. It set up perfectly and looked absolutely beautiful; full of color and life, unlike the store bought brand. Everyone gathered round the table in anticipation of trying the condiment. We all took a lick from the spoon and then looked at each other in horror... it was terrible! What went wrong? Back to the computer for a quick search on how to make homemade mayo taste more like what my guys were used to, you know, without all the nasty ingredients. Turns out it was the olive oil, along with a few minor adjustments. We switched to a more neutral oil, sunflower, and just like that it was the most delicious mayo we'd ever tasted. I can't tell you how thrilled I am to be able to use our farm fresh eggs and a few simple ingredients to make a healthy version of one of our favorite foods. Here's the recipe that we settled on. 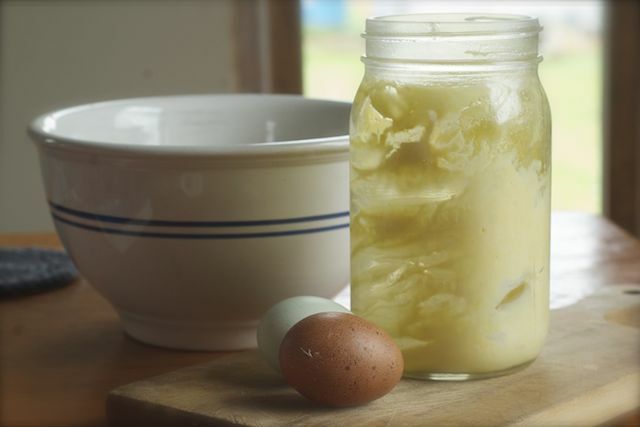 In a mason jar, beat the egg yolks and mustard with a stick blender. Very slowly, drizzle the oil until it starts to thicken. Add salt and pepper, sugar, and lemon juice at the very end. Have you ever made homemade mayo? Any tricks you'd like to share?